Got this in email a couple of weeks ago and failed to post it (as I did for a bunch of cool emails I got recently). 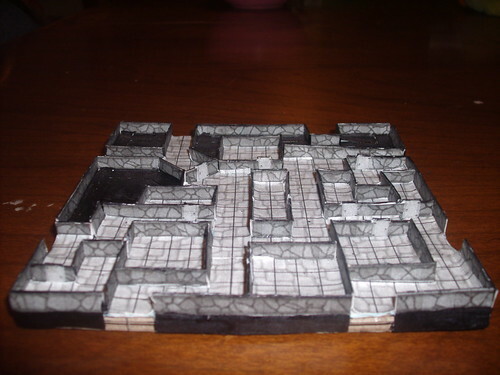 It’s a classic 100 x 100 geomorph, papercrafted at battlemat scale (1″ = 5′ as opposed to my own scale of 1″ = 40′). The actual work was done by Jason Gibson who remains blogless, and is his first try at a papercraft dungeon – expect that we’ll see some cleaner and smoother work in the future as he gets a grip on the medium. You can check out a few other photos of the geomorph here on his Flickr Photostream. That is incredibly awesome. I love me some papercraft, but my ogre fingers tend to stymie any attempts. Cool! Let’s encourage Mr. Gibson to blog about his papercraft geomorph. Maybe a step-by-step? I was thinking of starting a blog about my crafting of these plus putting up a few other side projects, but wasn’t sure what to write about. I could so a step by step if people are interested. Just became your 1st follower! This makes me feel very crafty!